Fruits of danewort thicket may be used in piles, constipation, cardiac pain, sciatica, neuralgia. Flevia positive influence in pain and heaviness in the legs, varicose veins, peripheral edema and hemorrhoids. Immunoregulatory, immunostimulatory action. Potent antimicrobial activity in urinary tract infections. Reduces blood pressure. Gerophyte herbal cream has favorable effect on the regenerative processes in the skin in difficult healing wounds, varicose ulcers, fractures and burns. 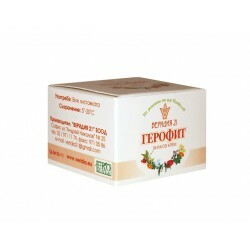 Herbal mixture №8 of "Zdravnitza" is composed of 10 herbs can be used for bleeding hemorrhoids. The amount is enough for a one-month reception!